Fairview Cub Pack #155 would like to thank Fairview Christian Church for supporting their Pancake Breakfast. See your newsletter for more information on this - or see the actual thank you note on the bulletin board outside Fellowship Hall. Check with the Scout Masters for additional information. from 8:00 am until noon in Fellowship Hall - serving the Pack's famous pancakes, coffee and more. COST = freewill donation (look for the donation baskets). So come out and support our Cub Scouts and get a hot breakfast in the deal. Troop 155 will collection turkeys, along with cash and canned good items. Come out and support the Scouts in their mission to help those in need. Tomorrow! Race Day! Get those wooden engines ready for the big race. Check in starts at 10 Races until every boy races. Siblings and even adults are welcome to race their own cars. Bring your friends and Family! Lunch will be available. What is Pinewood Derby you ask? 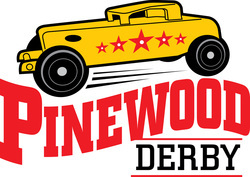 The pinewood derby is a racing event for Cub Scouts in the Boy Scouts of America. Cub Scouts, with the help of parents, build their own cars from wood, usually from kits containing a block of pine, plastic wheels and metal axles. With the popularity of the pinewood derby, other organizations have developed similar events, and a small industry has developed to provide tracks, timers, scales and other products. The pinewood derby was selected as part of "America's 100 Best" in 2006 as "a celebrated rite of spring" by Reader's Digest. Cubmaster Don M. organized the first pinewood derby, held on May 15, 1953, in Manhattan Beach, California, by Pack 280c. Don's son was too young to participate in the popular Soap Box Derby races, so he came up with the idea of racing miniature wood cars. The cars had the same gravity-powered concept as the full-size Soap Box Derby cars, but were much smaller and easier to build. After Don's first race in 1953 the Los Angeles County Department of Recreation copied the pinewood derby with Murphy's permission. In the 1980s, the design of the block was changed from a cutout block, consistent with a 1940's style front-engined Indy 500 car, to a solid block. The tires were also changed from narrow, hard plastic, to wider "slicks". The Cub Scouts had a chili cook off and baked goods sale. Proceeds from the bake sale will benefit the scouts attending summer camp. Update: The lunch was a huge success. The Scouts received over $800 in donations. They received $685.00 to help send some of Fairview's scouts to summer camp. November 27, 2013 Boy Scout Troop #155 - The 5th Annual Salvation Army/Boy Scout Thanksgiving Turkey Collection. Troop #155 will be at Hy-Vee in Gladstone (72nd & North Prospect) between 6:00am and 2:30pm collecting turkeys, along with cash and canned good items. Please purchase some extra items and donate to a good cause and help feed some hungry people. Click Scout Logo above to see the official flyer. This will open in a separate browser page - just close it to return to this page. April 13, 2013 1:00 P.M. The Congregation is invited to attend the Eagle Court of Honor for Jacob R. and Drake T.
Please R.S.V.P. to Sherry T or contact the church office. The ceremony will start in the Sanctuary first for the ceremony and then move to Fellowship Hall for the reception. Starting at about 8:00 AM through Koffee Klatch in the Fellowship Hall, Cub Scout Pack 155 will be cooking breakfast for anyone who wishes to eat. Pancakes, bacon, juice, coffee, etc will be served. So come out and support our Cub Scouts. NOTE: Also at the breakfast, for the Cubs winter service project, they will be collecting mittens, hats, scarves, socks, old coats that they will be giving to the Clay County Clothes Closet.